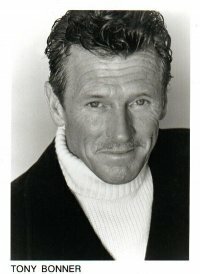 Tony is one of Australia’s most successful working actors with a career spanning over forty years. In recent years Tony has used the skills gained during his career to train and motivate young actors and models through privately held workshops and classes throughout Australia, New Zealand and Los Angeles. Some of Tony’s students are now enjoying world wide success on television, in film and on the stage. Tony’s work can be seen in The Anzacs, The Man From Snowy River, The Lighthorseman, Power Without Glory, Skippy, Cop Shop, Skyways, Home and Away and Neighbors. These are but a few of the award winning roles Tony has played. Tony’s Stage work includes the productions of Love Letters, Only When I Laugh, The Sentimental Bloke, The Cellophane Ceiling, Are your being served and The Three Musketeers, while his last play he directed was 'One Flew over the Cuckoo's Nest'. Tony’s most recent nomination from the AFI was for best supporting Actor in 2004. Bonner was born in Manly, New South Wales, a northern beach suburb of Sydney. His grandfather, James Bonner, was a former Mayor of Manly and founding President of the Manly Life Saving Club. His father, Frederick Bonner, was a musical comedy actor at Her Majesty's Theatre in Sydney. After leaving school he started work for a company supplying mannequins and other equipment for window dressing. He also worked part time in his father's theatre as a wardrobe attendant, fostering his interest in acting. Tony's first professional stage acting job was in 1961, aged 18. His first major role was as helicopter pilot Jerry King on the television series Skippy. He went on to appear in many Crawford Productions television series including The Box, Matlock Police, Division 4, Cop Shop, Skyways and Carson's Law. Notable film roles include Eyewitness (1970) and The Man from Snowy River (1982). He also twice portrayed Australian World War I soldier Murray Bourchier, to whom he bears a remarkable likeness, in the 1987 film The Lighthorsemen and a 1993 episode of The Young Indiana Jones Chronicles. Tony also does advertising work, such as the part of veteran burger naming expert Ken Thomas in a 2007 McDonald's ad campaign. Bonner recorded a cover version of the Bee Gees song "Wine and Women" in 1968. He later appeared with Barry Gibb on an episode of Bandstand. Later in his career Bonner appeared in several stage musicals including Annie Get Your Gun and How to Succeed in Business Without Really Trying. Bonner is patron of several charities including The Smith Family and the Wesley Mission suicide prevention program. As well as Bonnie Babes Foundation, S.I.D.S., and the PAACSA (Children's Abuse Foundation). He has also served on the board of the Variety Club and is Publicity Officer and past President of the Manly Life Saving Club and the Australian Television Society. Tony regularly teaches classes in film, television and theatre for the actor and has conducted classes in Sydney, Brisbane, Gold Coast and LA and at the Australian Stunt Academy.